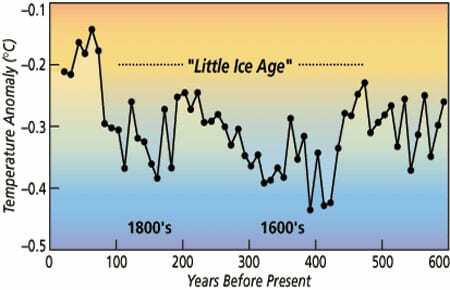 The Little Ice Age, and several preceding centuries, which are often called the “Medieval Warm Period,” are the subject of controversy. Neither epoch is recognized at all locations around the globe, and indeed at some locations there is clear evidence of warming while others show distinct cooling. One author titled a paper: “Was there a Medieval Warm Period, and if so when and where?” Nevertheless, when data from all Northern Hemisphere locations are considered, the annual average summer temperature proves to be a few tenths of a degree lower during the coldest part of the Little Ice Age in the late 1500s and early 1600s. Various forcing mechanisms have been proposed for such changes, including variation in the sun’s energy output, volcanic eruptions, and mysterious internal oscillations in Earth’s climate system, but none satisfy all of the data. Natural climate changes like the Little Ice Age and the Medieval Warm Period are of interest for a few reasons. First, they occur on decade to century time scales, a gray zone in the spectrum of climate change. Accurate instrumental data do not extend back far enough to document the beginning of these events, and historical data are often of questionable accuracy and are not widespread geographically. Geological data clearly document globally coherent climate change on thousand-, ten thousand-, and hundred thousand-year time scales, so why is the record so confusing over just the past 1,000 years? Second, as humanity continues to expand and make more demands on our planet, annual average temperature changes of a degree could have considerable social and economic impacts. Third, as there is widespread agreement among climatologists that changes due to human impacts on atmospheric chemistry will eventually lead to global warming of about two degrees over the next century, it is important to understand the natural variability in climate on the century time scale. Will the human effects occur during a time of natural warming or cooling? Of several approaches to studying climate on decadal to century time scales, here I will touch on the study of long series of measurements made at sea and the study of deep sea sediments. Ordinarily, there is little overlap between these two approaches. Reliable and continuous hydrographic observations rarely extend back beyond several decades, and deep sea sediments usually accumulate too slowly to resolve brief climate changes. However, the northern Sargasso Sea is a region where we have five decades of nearly continuous biweekly hydrographic data, a long history of sediment trap collections to document the rain of particles from the sea surface to the seafloor, and exceptional deep sea cores of sediment. The co-occurrence of these three elements has led to one of the first reconstructions of sea surface temperature for recent centuries in the open ocean. Oceanographically, Station S in the western Sargasso Sea is important because temperature and salinity change there is typical of a large part of the western North Atlantic, and it is exclusively western North Atlantic water that is transported northward and eastward by the Gulf Stream. These are the waters that eventually cool and sink in the Norwegian and Greenland Seas, flowing southward to complete a large-scale convection cell that plays a fundamental role in regulating Earth’s climate. In addition to long time series of hydrographic data from Station S, the site is remarkable for the long series of sediment trap data collected by WHOI’s Werner Deuser, beginning in the 1970s. 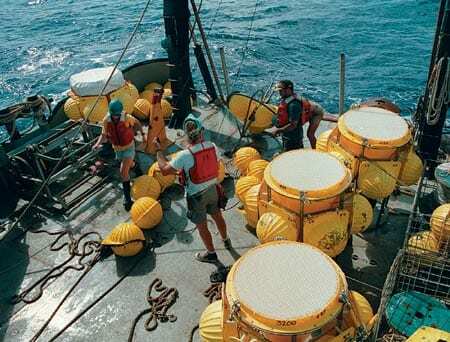 Those traps have recovered nearly continuous samples of the seasonally changing rain of particles that settle from surface waters to the seafloor. An important component of those particles is the calcium carbonate shells of planktonic protozoans known as foraminifera. There are about 30 species of foraminifera, or “forams,” and Deuser’s investigations have established the seasonal change in species abundance and their stable isotope composition. We now know from these studies that only one species of planktonic foram, Globigerinoides ruber, lives year-round at the surface of the Sargasso Sea, and it happens to deposit its calcium carbonate close to oxygen isotopic equilibrium with seawater. This means that G. ruber is ideal for reconstructing past changes in the temperature and salinity of Sargasso Sea surface waters, as the figure at right illustrates. Note that the average sea surface temperature and salinity from near Bermuda display some systematic variability on an annual average basis since 1955. These changes reflect a decade-long variability in the North Atlantic climate regime that is known as the North Atlantic Oscillation (see Deser article inset by McCartney). In this time series, the most severe climate occurred in the 1960s when annual average sea surface temperatures were depressed about half a degree by extreme storminess in the western North Atlantic. Cold, dry winds during winter storms also probably raised surface ocean salinity in the 1960s by promoting increased evaporation. If we had “annual average forams” from the 1960s, their oxygen isotope ratio would look like the time series shown in purple. 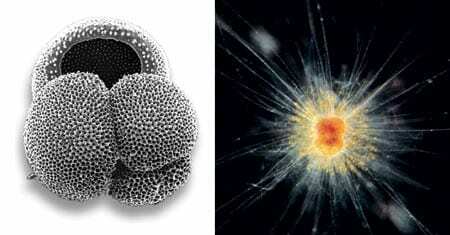 The biggest climate change of the past five decades could indeed be recorded by the forams. Long before I knew that G. ruber was the best possible foram for reconstructing sea surface temperatures, I selected that species for my stable isotope studies because of its consistent abundance on the Bermuda Rise, in the northern Sargasso Sea to the east of Station S. At the time (the early 1980s), the Bermuda Rise was under consideration as a possible site for burial of low level nuclear waste, and it was necessary to know how rapidly and continuously the sediment accumulates. It turns out that because of the action of deep ocean currents, fine-grained clay and silt particles are selectively deposited there, resulting in very high rates of sedimentation. And whether samples are of modern or glacial age, G. ruber is consistently present. Much of my work over the past decade has documented the climate changes that occur on thousand year time scales and are preserved in foram isotope ratios and other data from Bermuda Rise sediments. Until recently, the available data from the Bermuda Rise showed evidence of century- to thousand-year climate change continuing right up to about a thousand years ago, the age of the sediment at the tops of our cores. Because these samples were recovered with large, heavy tools that free fall into the seafloor, I suspected that they might have pushed away sediments of the last millennium without actually coring them. As a test of this idea, we acquired a box core from the Bermuda Rise (box cores penetrate the sea-floor slowly and disturb surface sediments little) and radiocarbon dated its surface sediment at the National Ocean Sciences Accelerator Mass Spectrometry Facility located at WHOI. Results showed that the sediment was modern, and additional dates were used to construct a detailed chronology of the past few millennia. When temperatures were calculated from oxygen isotope results on G. ruber from the box core, and when data were averaged over 50 year intervals, I found a consistent pattern of sea surface temperature change (see figure at right). The core-top data indicate temperatures of nearly 23 degrees, very close to the average temperature at Station S over the past 50 years. However, during the Little Ice Age of about 300 years ago sea surface temperatures were at least a full degree lower than today, and there was an earlier cool event centered on 1,700 years ago. Events warmer than today occurred about 500 and 1,000 years ago, during the Medieval Warm Period, and it was even warmer than that prior to about 2,500 years ago. These results are exciting for a few reasons. First, events as young and as brief as the Little Ice Age and the Medieval Warm Period have never before been resolved in deep sea sediments from the open ocean. Because the Sargasso Sea has a rather uniform temperature and salinity distribution near the surface, it seems that these events must have had widespread climatic significance. The Sargasso Sea data indicate that the Medieval Warm Period may have actually been two events separated by 500 years, perhaps explaining why its timing and extent have been so controversial. Second, it is evident that the climate system has been warming for a few hundred years, and that it warmed even more from 1,700 years ago to 1,000 years ago. There is considerable discussion in the scientific literature and the popular press about the cause of warming during the present century. Warming of about half a degree this century has been attributed to the human-induced “greenhouse effect.” Although this is not universally accepted, it is widely accepted that eventually changes to Earth’s atmosphere will cause climate warming. The message from the Bermuda Rise is that human-induced warming may be occurring at the same time as natural warming—not an ideal situation. Finally, building on the studies of physical oceanographers and climatologists, marine geologists and paleoclimatologists may use the North Atlantic Oscillation as a model for understanding North Atlantic climate change on longer, century and millennial time scales. This work was funded by the National Oceanic & Atmospheric Administration’s Atlantic Climate Change Program. We encourage Oceanus authors to include a bit of humor in the short biographies we request. Lloyd Keigwin claimed to be”a humorless scientist” who doesn’t like writing bios, so we asked Eben Franks, a research assistant in Lloyd’s lab, to provide some information. Here’s what Eben wrote: In addition to running a demanding research program, Lloyd Keigwin is also a Commander in the Navy Reserve. Despite nearly 30 years of sea-going experience he still finds himself subject to seasickness. [Editor’s note: This is not unusual among oceanographers!] Lloyd has been deeply affected by episodes of the popular PBS series “This Old House” and has spent 14 years (and counting) demolishing two perfectly adquate houses in the name of renovation. His limited spare time is consumed with multifarious projects ranging from attempting to convince the Navy to convert a nuclear sub for oceanographic research to casting longing looks at the antique German and British sports cars collecting dust in his barn. Shells of planktonic animals called formainifera record climatic conditions as they are formed. This one, Globigerinoides ruber, lives year-round at the surface of the Sargasso Sea. The form of the live animal is shown at right, and its shell, which is actually about the size of a fine grain of sand, at left. Since 1978, Scientist Emeritus Werner Deuser has collected a nearly continuous suite of deep sediment trap samples at the Ocean Flux Program site near Station S. The Ocean Flux Program traps are shown following recovery aboard the Bermuda Biological Station vessel Weatherbird II. The traps were deployed along a bottom tethered mooring at 500, 1,500 and 3,200 meters depths to intercept particles sinking through the water column. Deuser recently passed the leadership of the Bermuda time-series program on to Assistant Scientist Maureen Conte. Estimated sea surface temperature from Station S annual averages and from Globigerinoides ruber shell oxygen isotopes averaged at 50-year intervals. Note that the range of sea surface temperature variability on longer time scales is much larger than what has been observed since 1954 at Station S.